Do you like chocolate? If not, please exit this blog immediately. Nah, just kidding (sort of). However if you do like chocolate, then let me introduce you to one of the greatest desserts in the world. I realize that is an extremist statement, but I stand by it nonetheless. I’ve had chocolate mousse plenty of times before and it has always been fine, delicious even, but not that kind of mind-blowing good that you really want in the ultimate dessert. My feelings about chocolate mousse started to change from like to serious love when I had it for dessert at one of my favorite restaurants, The Oceanaire. This chocolate mousse was unlike any I had ever tried. 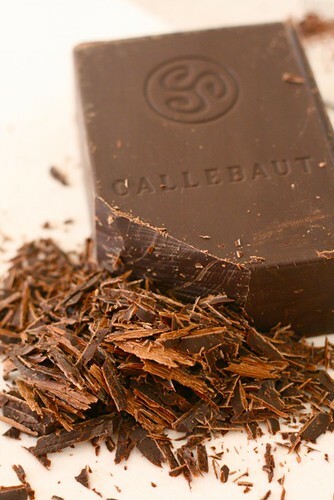 Smooth, thick, rich and somehow light at the same time, with a pure chocolate flavor. I most recently had their fabulous chocolate mousse again about a month ago when we were there to celebrate my birthday. It was just as perfect as all the times before, and this time I was inspired to find a version just as good that I could make at home. The search didn’t take long, since I knew exactly where to look. I read The Sweet Life in Paris by David Lebovitz several months ago and thoroughly enjoyed it. Peppered amongst David’s hilarious and witty commentary are some of his favorite recipes, including two for chocolate mousse. A traditional chocolate mousse uses raw eggs, and since I wanted the best chocolate mousse possible, I decided I could handle the raw eggs. In fact, this recipe has only two main ingredients – eggs and chocolate. It is amazing to me that such a perfect dessert comes from such simple ingredients. Good quality chocolate is very important in this recipe (you know the saying – if you’re going to do something, do it right.) And in case you were wondering, this version completely lived up to the restaurant variety. Bliss, pure bliss. Combine the chocolate and water in a heatproof bowl set over a pan of simmering water. Heat until the chocolate is almost completely melted, stirring occasionally. Remove the bowl from the heat and stir until the mixture is smooth. Set aside and let cool to near room temperature. In a clean, dry bowl of a stand mixer fitted with the whisk attachment, combine the egg whites and the salt. Whip on medium-high speed until stiff peaks form. They should be thick and smooth. Stir the egg yolks into the cooled chocolate mixture. Add one third of the whipped egg whites to the bowl with the chocolate and fold gently to lighten up the mixture. Fold in the remaining egg whites gently with a spatula just until no visible streaks are left. Portion the mixture into 4-6 individual serving dishes (or 2 larger serving dishes, for a romantic, share-friendly dessert). Cover with plastic wrap and refrigerate at least 3 hours. 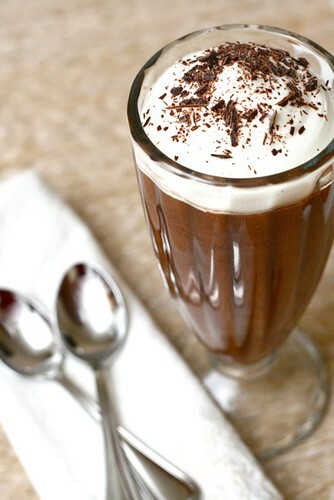 Serve as desired with freshly whipped cream and chocolate shavings.